Beach: About 1 mile from Ridgevale and Hardings Beaches. 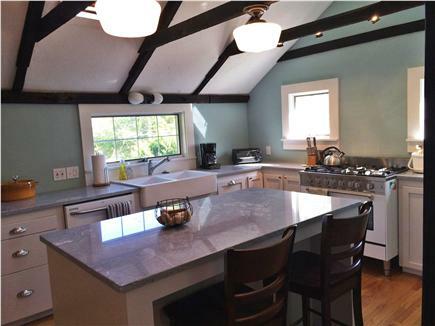 Fisherman's Farmhouse is a spacious and popular antique home renovated in 2014 to include all the modern amenities. 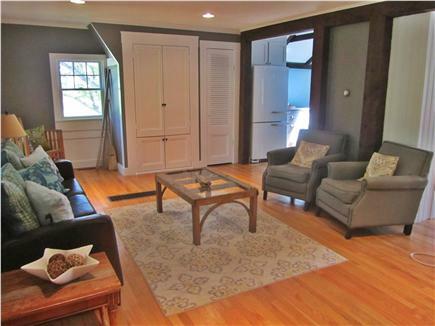 Both the kitchen and living room have new hardwood floors and furnishings. The large dining room seats up to 12 and the spacious and open configuration includes a remodeled full bath w/clawfoot tub and a bedroom on the first floor, and three bedrooms and full bath on the second floor, making it perfect for a large group or two families vacationing together. 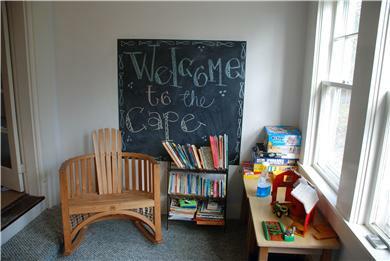 The farmhouse also includes a children's play room with toys, games, chalk board and art table. Free wireless internet access is also provided. Fisherman's Farmhouse is located a little over a mile from family friendly Ridgevale beach with its snackbar, restroom facilities and ample parking lot. Popular Hardings Beach is also just over a mile away. Chatham village is a three minute drive. Like to walk or bike? 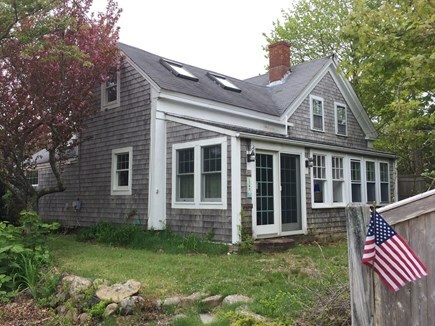 Wide sidewalks run all the way into the village or you can hop on the bike path to Chatham or Harwich and beyond! No need to overpack – Fisherman's Farmhouse is ready for your summer vacation – fully stocked kitchen, two grills (one gas, one charcoal) and a wide assortment of beach necessities. The beautifully appointed living room includes a flat screen TV and DVD. 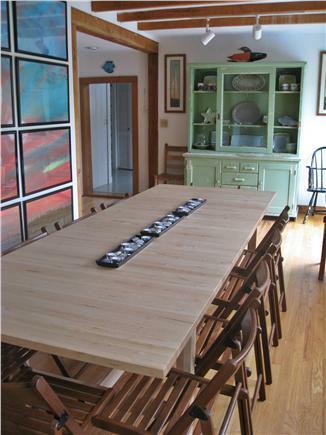 The spacious dining room seats ten to twelve comfortably at the farmhouse table. 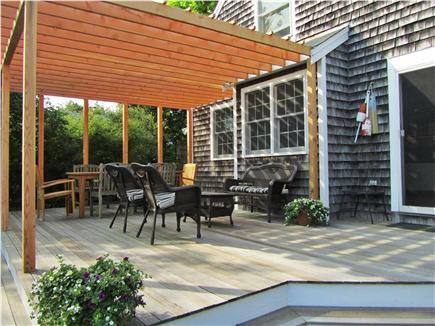 Sliding doors lead out to the expansive mahogany deck with pergola and very private, fenced backyard. The outdoor shower with privacy fencing is a real treat after a long day at the beach. In the new chef’s kitchen you will find everything you need to create anything from the simplest of fare to a gourmet meal. The bedrooms are large and bright, with skylights in each of the three upstairs. The master bedroom has a king-sized bed, built-ins and a large flat screen TV. The Whale room has a queen sized bed and the Fish room is perfect for children with three twin beds, a toddler bed, 2 pullout chairbeds and a flat screen TV with built in DVD. The downstairs bedroom (two twins) features fresh paint and comfy new mattresses. All of the bedrooms and the living room have window A/C units. Nearest beach: About 1 mile from Ridgevale and Hardings Beaches. Additional pricing info: We accept checks or Venmo as well as credit cards via Paypal for payment. State and local taxes of 12.45% will apply. 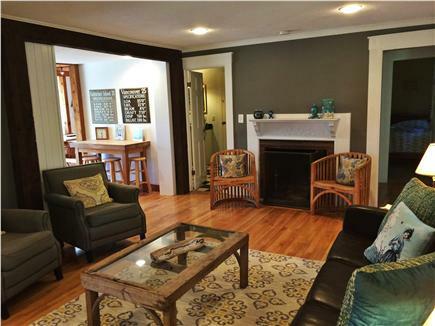 While not fully accessible, the farmhouse does have a first floor bedroom and bath with tub and handheld shower. Best 4th Ever - Why would I lie? This house was absolutely perfect for my best girlfriends and I. We rented this house for a week over the 4th of July and it was perfect for the 10 of us! Each of us had a bed and there was room to spare! The outdoor deck was perfect for grilling and relaxing and you feel right at home being there. 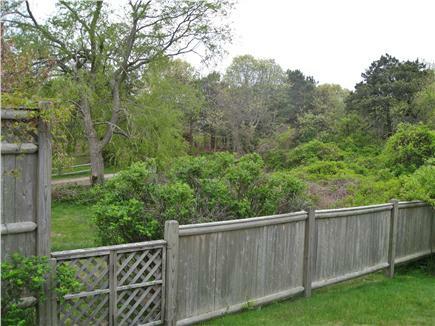 The backyard was private and secluded and also this location could not be more convenient. We will definitely be going back for years to come! From the moment we arrived, I was relieved how much time I spent researching the perfect rental because this house was so good on paper, it made me nervous until the moment we stepped foot inside. It was a perfect layout for us. This family has created the ultimate vacation getaway house. The easy accessibility of this house from the main road, number of bedrooms, gourmet kitchen, fenced back yard, proximity to both downtown & beaches, tranquility of the backyard, made our stay truly excellent. It was the first time a rental checked every box for us and still was an affordable price! I typically don't spend time in the kitchen when we are on vacation, but this beautifully appointed kitchen was a pleasure to cook in. The dining room is huge and seats 12+ people, though we are only six, so the extra space felt luxurious. The living room and separate playroom were such a bonus when we wanted to watch a movie and relax, but still wanted the younger children be close enough by to keep an eye on. We loved the fact that we didn't have to bring linens, an iron, pots/pans or beach towels. This family house is literally stocked with everything you could possibly need. We loved every minute of this vacation! 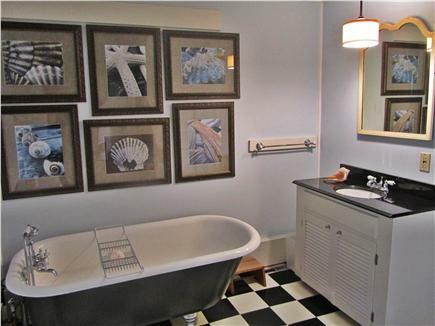 The house is exactly what the pictures show. The outdoor shower was our favorite! We loved that the house is in the middle of two great beaches (Harding's & Ridgevale) for young kids. The bike trail was a half mile away. My husband and I hopped on it a few mornings and rode in to downtown Chatham for breakfast. We rented kayaks from Chatham Kayak with our daughters (6&8yr old) and explored Stage Harbor and Oyster Pond. />There is so much to do that we need 2 weeks next time! Sadly our Fourth of July was spent indoors, but the rest of our stay was beautiful! We enjoyed a different beach every day from Dennis to Wellfleet but our favorite was Cahoon Hollow beach - we were able to bring our dog and enjoy lunch at the beachcomber. We've been coming to the cape for years but this was our first stay in Chatham, we couldn't have asked for a better place to stay! Catching a few keepers - Striped Bass & Cooking them up! 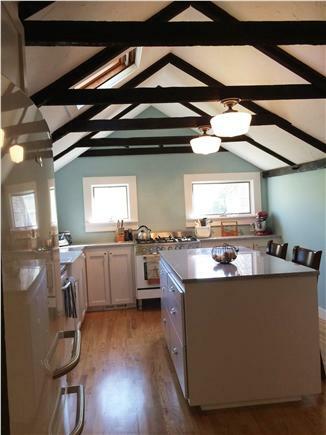 What a beautiful new kitchen to enjoy! Thank you so very much Linda & Matt. Family from Montana, New Jersey & Florida joined us for some days - great family time! We too had three generations - 5 under 5 - who had the greatest time at Chatham. Thank you so much for sharing your wonderful house and making our family vacation a great success. Three generations - including two babies had a great 4th of July in Chatham. Everyday at Ridgevale beach! Thank you so much for lending us your great house!